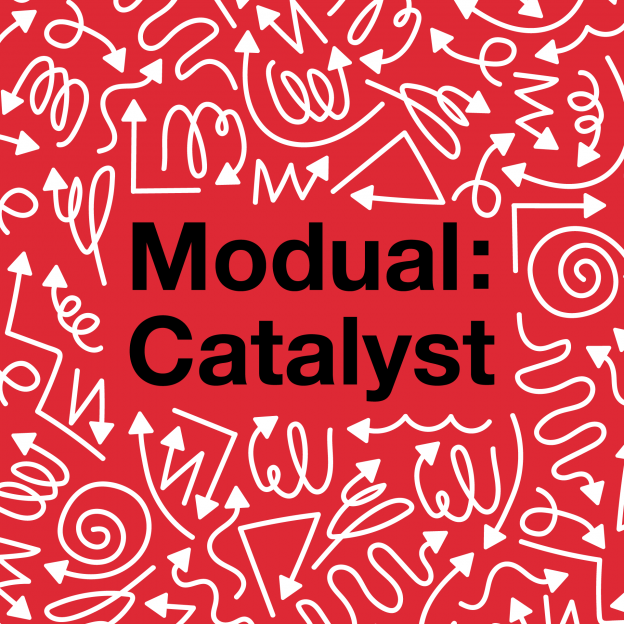 Modual Catalyst is a 6-day intensive workshop for UAL staff development led by CSM Professor of Digital Art Fred Deakin and UAL’s Head of Digital Learning David White. Fred also ran a student version of Modual, this year was themed Modual Maker which focused on cross-college and multidisciplinary projects to develop innovative products which explore the future of making. This entry was posted in Digital, Events and tagged digital, digital learning, events, modual on April 17, 2019 by Hannah Hyde. Teaching Complexity was a series of open online seminars that were designed for anyone in a teaching, teaching related or staff development role in higher education. Hosted by the Teaching and Learning Exchange, they were free to attend and run online to provide equal access to participants regardless of geographical location. 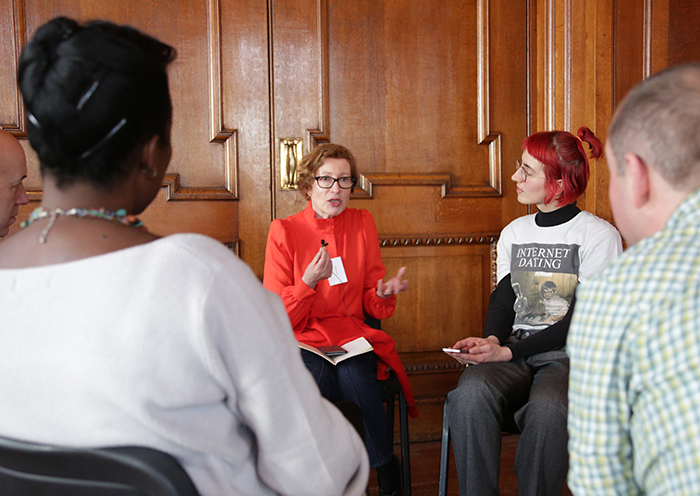 Alongside international participants they were attended by those currently teaching and working in staff development at UAL and other HE institutions and even by a prospective UAL student. The series was curated by Bonnie Stewart (Visiting Fellow, UAL and Assistant Professor of Online Pedagogy & Workplace Learning, University of Windsor) and David White (Head of Digital Learning, UAL) from the Teaching and Learning Exchange at the University of the Arts London. Each session had additional guest facilitators providing more in-depth commentary and guiding topics for the participants to discuss in the chat room. Through talks, discussion and other activities, the seminars explored how open and creative approaches to teaching and learning can help students navigate the complexity of higher education and the digital environment. This entry was posted in Digital and tagged digital, digital learning, TeachCom, Teaching Complexity on April 8, 2019 by Hannah Hyde. 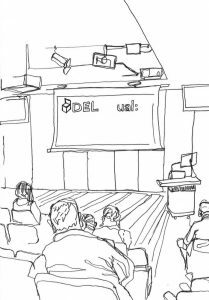 Teaching Complexity was a series of open online seminars curated by Bonnie Stewart (Visiting Fellow, UAL) and David White (Head of Digital Learning, UAL) from the Teaching and Learning Exchange at the University of the Arts London. This entry was posted in Digital on March 8, 2019 by Hannah Hyde. The UAL Teaching Platform series explores key issues in art and design teaching and learning in higher education. 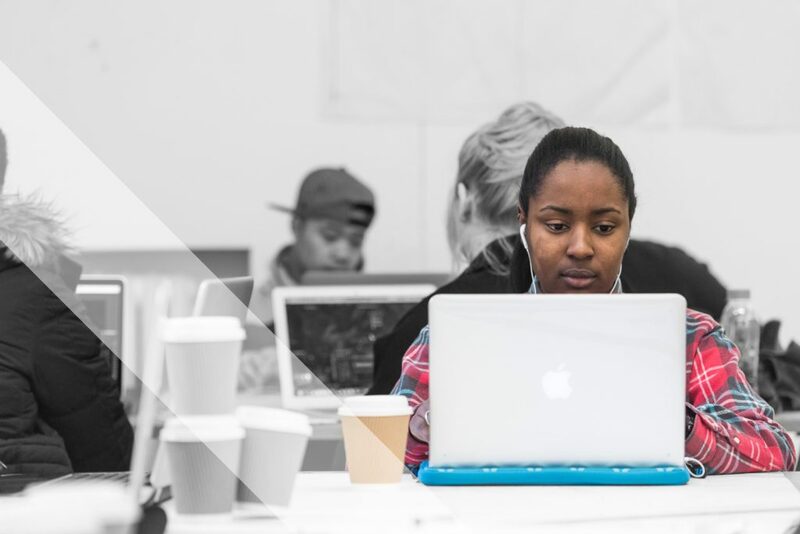 At Critical Creative Digital, held at Chelsea College of Arts in December 2017, we discussed how the university sector can take advantage of the positive, creative opportunities of digital in a networked era. David Crow (Pro Vice-Chancellor and Head of Camberwell, Chelsea and Wimbledon colleges) spoke about Digital Craft, and the evolution of master craftsmen into today’s designer-makers. The Burnt! activity asked delegates to share experiences, hopes and fears around the digital. A key theme arising from this session was collaboration, in a number of different forms. 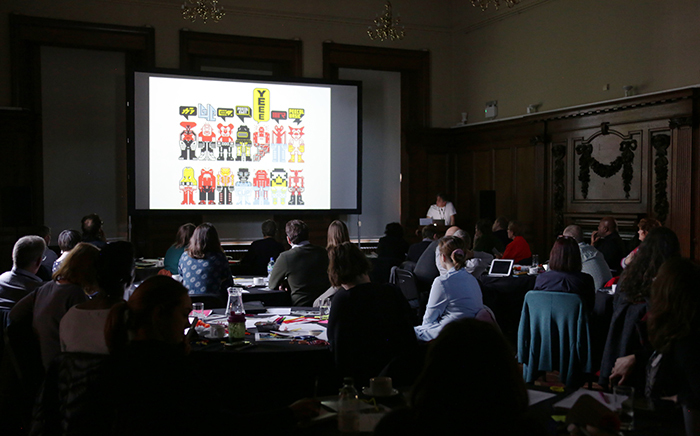 We heard from David Barnett, Course Leader for BA Graphic Design Communication at Chelsea College of Arts. David is fostering a graphic design community across current students and alumni, and an impressive panel of his students took questions from the audience. 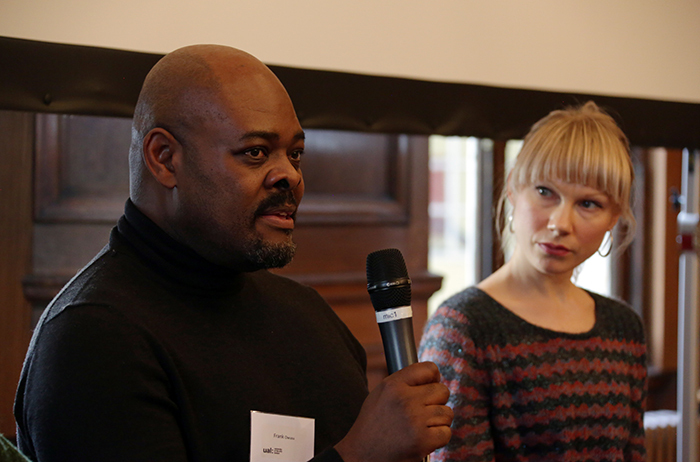 The final panel session included Judith Aston (UWE), Charlotte Webb (UAL Digital Learning Coordinator and Chief Leopard, Feminist Internet) and Frank Owusu (Communication Pathway Leader, CCW Foundation Diploma in Art and Design). The group interrogated the tensions between network (the Web) and hierarchy (the institution) to explore an ideal creative university for the networked era. 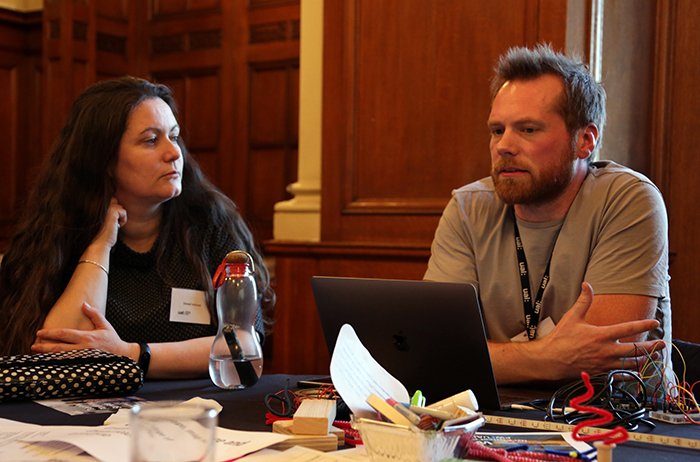 Alongside this exploration we celebrated current practice in the ‘Digital UAL’ (DUAL) expo, bringing together inspiring responses to digital in teaching, learning and making from across the university. 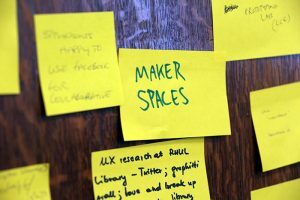 Adam Corrie introduced the London College of Communication Prototyping Lab, a multi-purpose space that supports students in creative code and physical computing. The UAL Digital Learning Coordinators shared their Digital Fluency Project, whilst Exchange tutors Ruth Powell and Jon Martin gave an overview of the Technology Enhanced Learning Unit on the UAL MA Academic Practice. Lewis Bush is a Lecturer at London College of Communication and a student on the UAL PgCert Academic Practice, and shared his project entitled The Networked Essay. Kalina Pulit, also a UAL PgCert student, interviewed delegates about their experiences of the digital engagement of Generation Z.
Gareth Foote spoke about the work of the Digital Anthropology Lab at London College of Fashion. And finally Chris Follows introduced the Digital Maker Collective and the Tate Exchange to the audience. 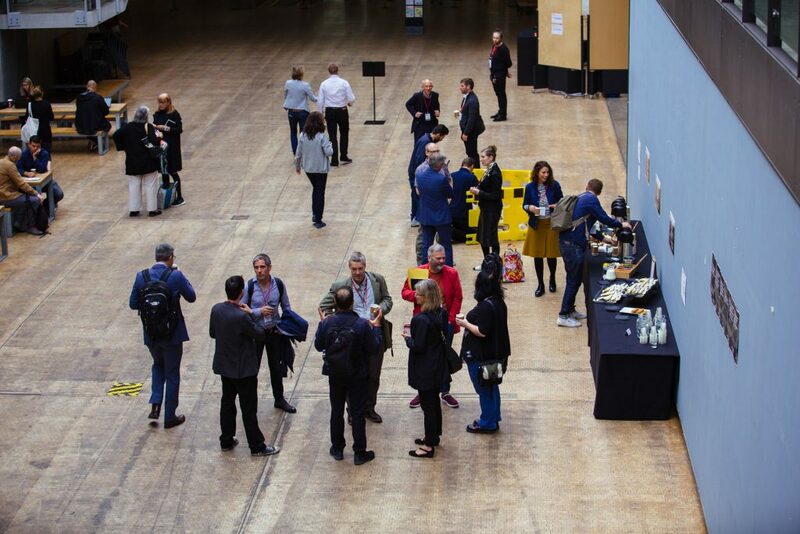 This event is part of a series hosted by University of the Arts London, exploring key issues in art and design teaching and learning in higher education. Each event includes leading speakers sharing current thinking in creative education and is designed to be interactive: delegates will have opportunities to engage in activities to support networking and engagement. Platform events are free and open to external guests. For more information about Teaching and Learning at UAL visit the Exchange website. To subscribe to our mailing list for more details about these and other events, please email teachingexchange@arts.ac.uk, or follow us on Twitter @UALTLE. This entry was posted in Digital, Events on February 26, 2018 by Teaching and Learning Exchange. DEL: the educational technology conference for the creatively engaged. (Dalek optional). 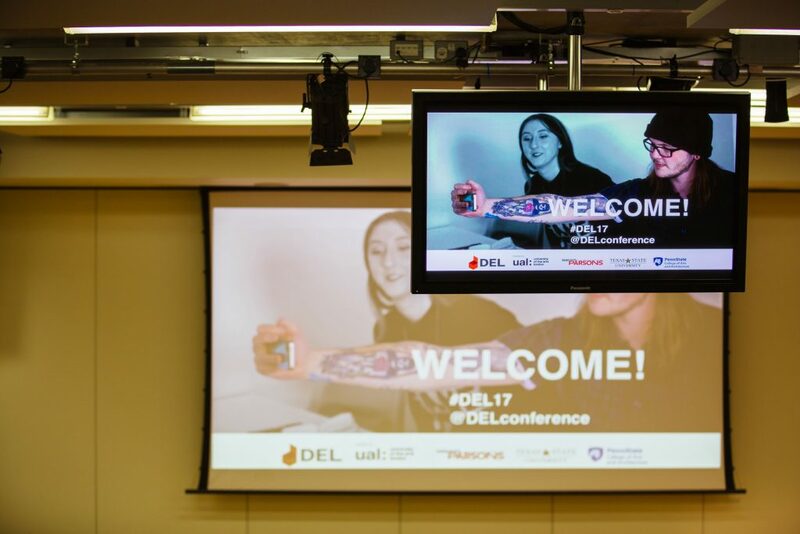 DEL (Digitally Engaged Learning) is an annual conference organised in partnership with University of the Arts London, Texas State University, Penn State University and The New School’s Parsons School of Design. Each year DEL is hosted by one of these partners or an invited host institution, bringing together educators and learners from across the UK, USA, Canada, Europe and the southern hemisphere, to celebrate and critique digitally engaged teaching and learning in art and design Higher Education. 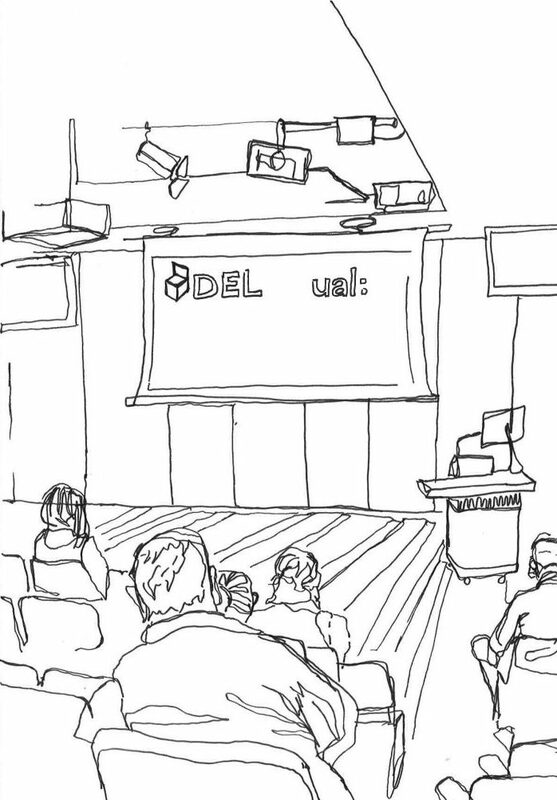 DEL is purposefully inclusive, and its participants, including educators, technicians, librarians, instructional designers, artists, makers, researchers, art historians, digital humanities scholars and others, draw upon a broad array of references and practices in their presentations and workshop activities. There is no core theoretical canon underpinning the conversation, and the conference ethos encourages attendees to share their individual approaches and scholarly experiences. Attitudes, planned investigations, uses of digital tools (their affordances and subversions), networks, malfunctions, failings and happy accidents are given equal credence; the practical is esteemed as much as the academic. 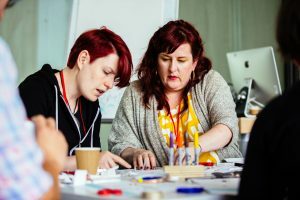 This is a conference for those who are engaged in teaching, learning and creative practice, whatever their particular expertise – its intention is mutual development and encouragement across territories. This conference presumes an interest in the ways learning takes place in a digitally networked age, whilst being aware that inspirational pedagogy was in operation prior to the advent of computers, digital devices and the internet. It encourages an appreciation of how new technologies can enhance traditional understandings and vice versa – the presumption is not that technological novelty must replace established approaches. Whilst tensions around ‘the march of progress’ are often brought to the surface as delegates question the rationales of institutions, developers and one another, the environment is convivial. With their breadth of interests and disciplines, delegates come to hear and learn from one another and celebrate each others’ valuable perspectives. Moreover, there is the sense that being with each other in this conference space can forge new meanings that may be taken away and investigated in other contexts. As well as this atmosphere of community, a spirit of intentionality is at play. Programmes are carefully constructed to provoke dialogue, and always extend beyond traditional seminar spaces. Social aspects are viewed as intrinsic to this endeavour; recent conference dinners have been arranged around the barbecue of a bar terrace, across the tables of a pool hall or amidst the reclaimed garden of an urban construction site. Environments are arranged to inspire and foster friendly debate. The theme of DEL17, Making Teaching / Teaching Making, was designed to reflect ongoing concerns with the bridging of perceptions of a digital / physical divide. The social media threads that were woven throughout the conference events encouraged commentary from all present, and generated additional creative and conceptual resource. This is a conference where makers are able to collaborate with others, whether their selected tools are powered by electricity, battery or human motor. It is a visual environment, where ‘arts values’ are evidently afforded the regard they ought to be in academia. Music, movement and making are as key to the thinking and talking as reading will be in other circles; and computers play physical roles. Things will happen at DEL that cannot elsewhere, because the creative energy produced and channeled by the people that come together here drives the doing of more. 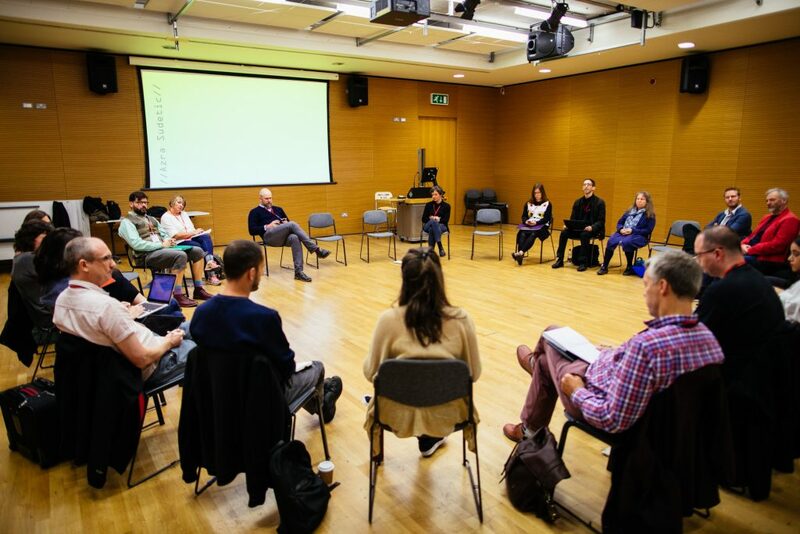 For example, at DEL17 a pre-conference event invited delegates to gather for an informal workshop of conversational prompts and making materials. 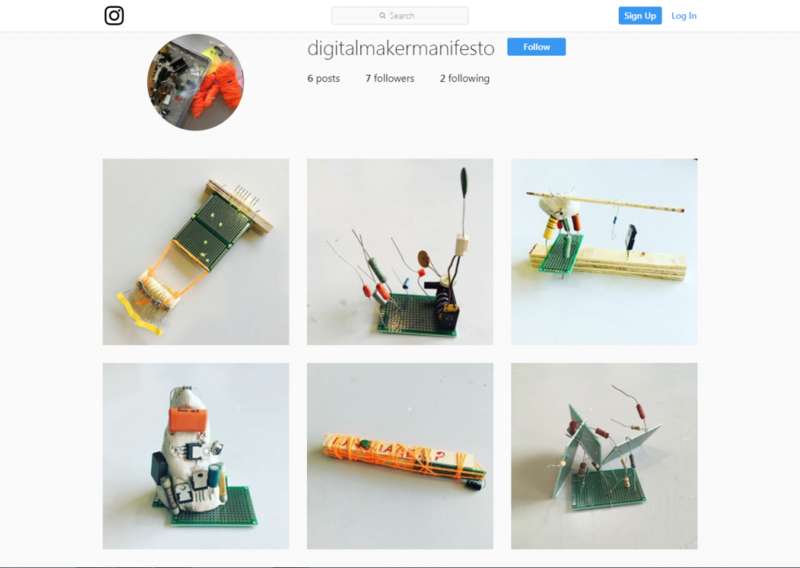 The physical-digital outcome was the #digitalmakermanifesto, launched on Instagram and featuring the artefacts produced, as provocation to further discussion. 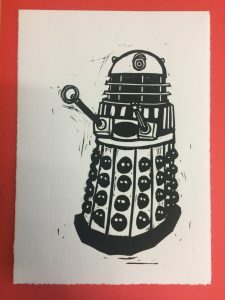 The ethos of ‘making conversations’ was encouraged by the presence of the DEL dalek: a mobile making space / device, kitted out with lo-tech tools and materials from which anyone might craft responses to discussions. 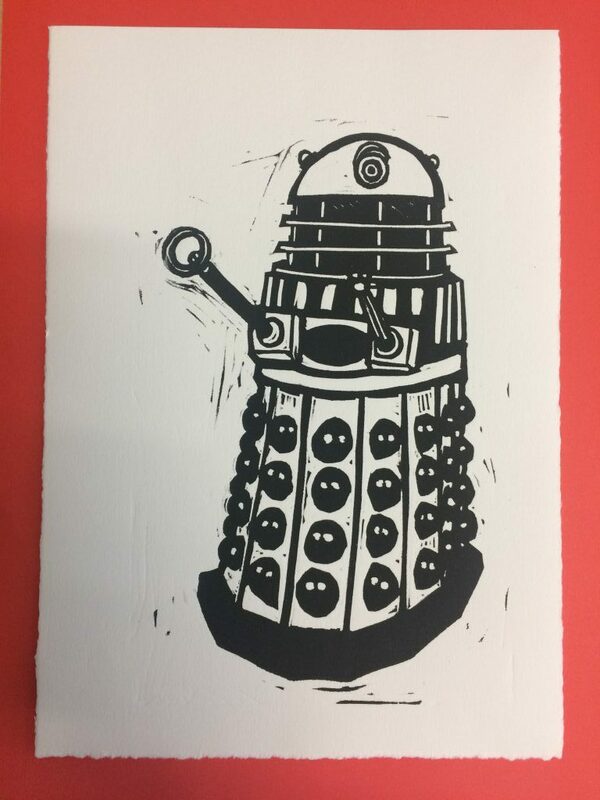 The dalek became a motif that infused both sessions and breaks at Central St Martins, UAL, with a sense of playful anarchy, and was utilised by various presenters in individual sessions: when people needed stuff to make things with, the dalek was wheeled in! From its initial entrance with a vocoder announcement of intent, it became adorned with decoration and post-its, and its material stocks depleted. Delegates took away the devices they had fashioned from it as aides memoires. At this conference, not only photographic, but also pen & ink and 3D documentation gets posted digitally, to illustrate its expansive happenings. in clay and a jam session with a group of staff and students who come together to explore emerging digital technologies: playing with pedagogy via computational materials. More traditionally academic presentations of research findings were equally prevalent, with discussions and workshops around learning environments, feedback, creative graduate attributes, big data and small scale curricula interventions exempla of the richly varied programme of events around and about creative disciplines. DEL is a conference for educators and those excited by the possibilities of education, in co-creation and construction of learning. Equally it makes calls to community and activism, as represented by politically-charged keynotes and student panels. You make of DEL what you will, since it presents platforms on and from which to work. Crucially, the conversation is always intended to extend beyond the physical space on the conference, recognising our networks and connections through digital means. Anyone who attends will be welcomed by a global community who recognise their privilege in being there, and want to extend this to others beyond. This entry was posted in Digital, News on February 12, 2018 by Teaching and Learning Exchange. From January 2018 the Digital Learning Support team in the Exchange will be moving its introductory workshops online. These sessions about our core platforms (Moodle, MyBlog and Workflow) will be scheduled on a regular basis and delivered using Blackboard Collaborate. This is a virtual classroom where the tutor will lead a presentation, engage participants in online discussion, answer questions and support people through a number of short exercises to help develop familiarity with the core features of each platform. There are a number of benefits from participating in online training. First of all is the flexibility provided, enabling participation from a location convenient to you. Being online also supports the development of your digital skills, and provides you with experience of being a learner in a digital space. The questions, challenges and opportunities you experience in these online workshops will enrich your knowledge and appreciation when it comes to applying your learning in your own context. To take part you will need a computer that is connected to the internet and a quiet space. If taking part from a shared environment then headphones will give a you a degree of privacy and help block out background noise. A microphone isn’t necessary as there will be plenty of opportunity for discussion via the online chat facility. Will the Exchange still offer Face-to-Face training? The simple answer is Yes! The online sessions cover the basics. If more in-depth training on any of the platforms is required, or you need specific advice or help with embedding digital into your teaching, then do get in touch at dlsupport@arts.ac.uk. Details of the new online offer and how you can book will be on the Teaching and Learning Exchange website from early December. This entry was posted in Digital, News on November 20, 2017 by Teaching and Learning Exchange.